The Pumpkin Spice Latte, (aka the #PSL) is widely contested. Is it basic or buzz-worthy? We set out to find out more about the classic drink and its social media presence on the day of its 2017 Fall season launch. It’s interesting that the most retweeted tweet, along with many other popular ones, were written in a different language, as shown below. Starbucks’ tweet garnered almost 15,000 retweets. It made sense that most Twitter users were also mentioning #starbucks in their tweets about PSL, due to the drink’s strong association with the brand. 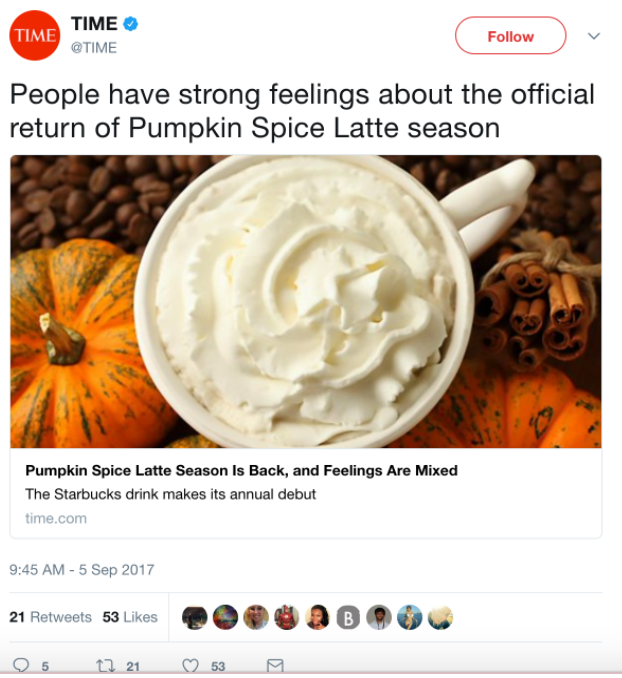 Users also knew it was #time for #fall and the return of the PSL. What’s interesting though, is that PSL also stands for the Polish People’s Party, which explains the Polish words that appeared in the Buzzgraph. It also explains why Poland was the second heaviest user of the term. If you couldn’t tell that September 5th meant the return of fall, this word cloud makes it loud and clear: A limited-time only PSL means September, pumpkins, leaves, and warm colors. (Peep the adorable most-tweeted emojis). 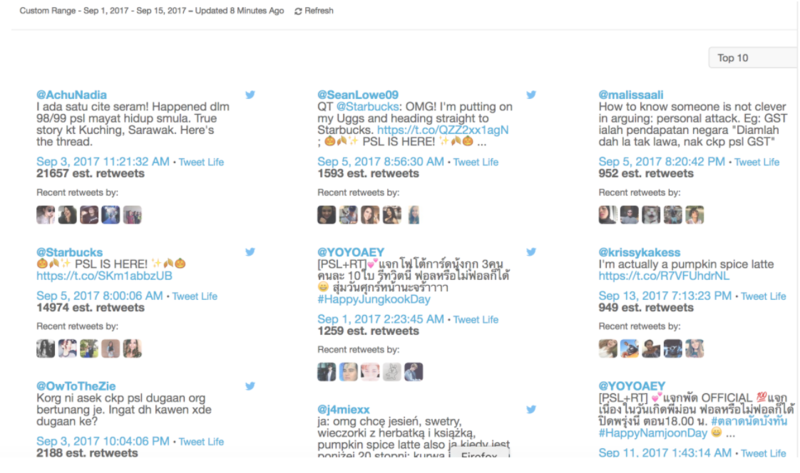 I loved that you added a lot of tweets and visuals to your Sysomos assignment in addition to the ones that were required. I enjoyed that you looked into a hashtag/ topic, that kind of falls under a lifestyle/ hipster trend section. It’s not a serious topic, but the internet is still all over it. 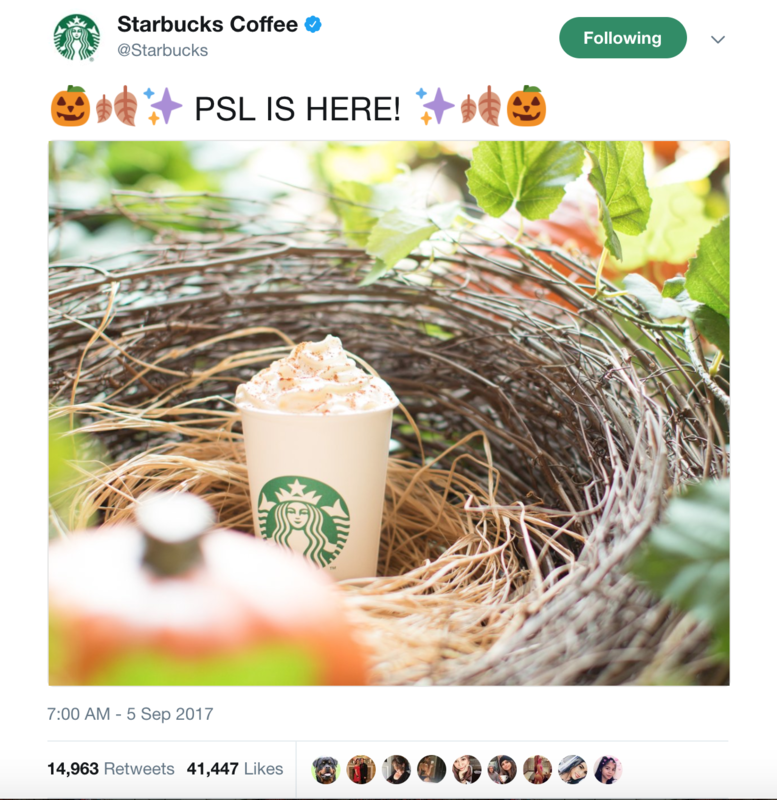 The only thing I might have done differently, was that I’d have look into the hashtag a little bit later than the actual launch date, because people might have not known when that day was and spoken more about #psl, after seeing it in stores/ online. Creative topic! This shows that Sysomos is also a good tool to decipher how most Twitter users feel about a topic. Would be also interesting to see if more women or men spoke about PSL. But anyway, I feel like I should get a Pumpkin Spice Latte now. This is such a creative and interesting topic. I feel like you guys had a consistent voice as you wrote this! 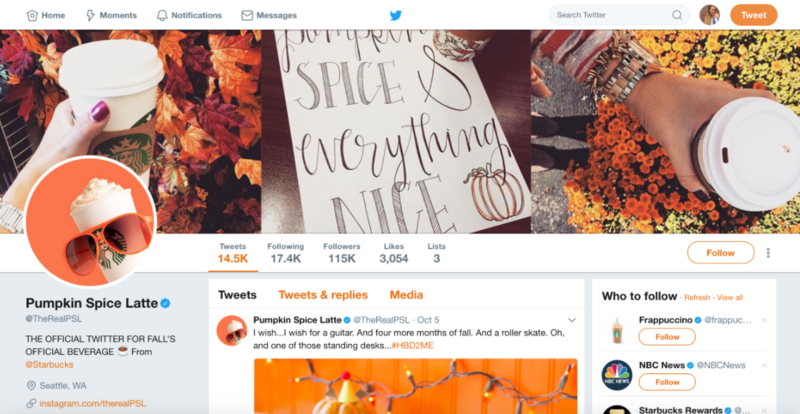 I enjoyed the little phrases to interrupt the reader like “apple picking in New York anyone?” I also never knew that the pumpkin spice latte had its own verified page…with glasses. It is interesting how the brand tried to humanize the latte, I guess I never realized how big the phenomenon actually is. Such a relatable topic! It was interesting to see how the most retweeted tweets were often in different languages. 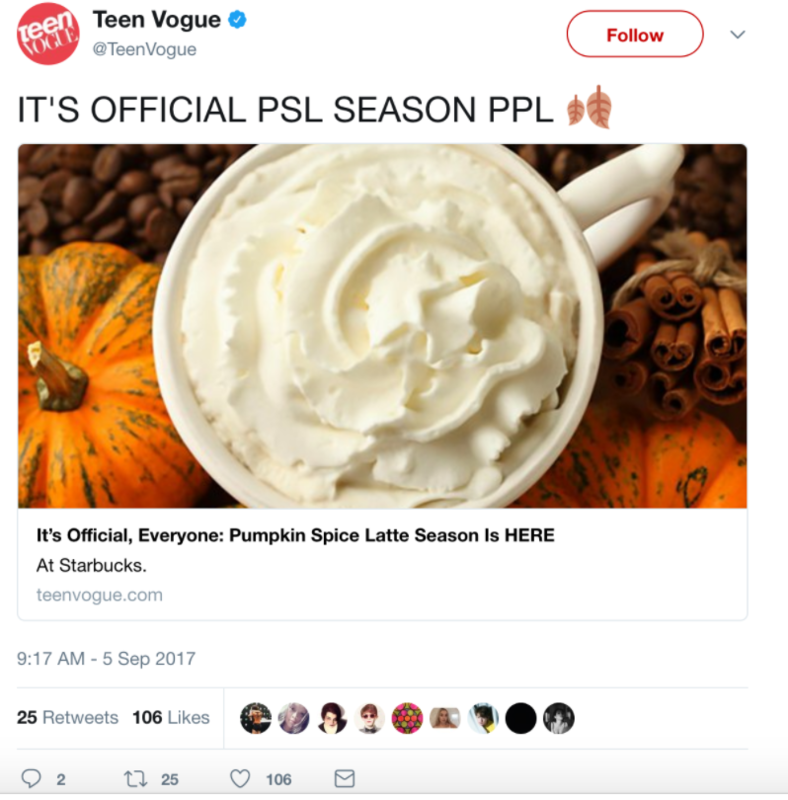 I guess the PSL fad is global! Obviously the PSL is a must-have fall staple, but it’s interesting to see what an icon it is for the season given how long it’s been around. It seems to really have become engrained into the “culture”, so to speak, of autumn. It’s also very interesting to see the intersection of the Polish political narrative, which proves that you should always research which hashtags you’re using to make sure they don’t already exist in another capacity.